Maryam Maquillage: Snake Skin for 2013! Happy New Year my friends!! I hope your NYE was spectacular and I wish you a year that reflects the celebration and is full of joie de vivre!! 2013 is the year of the Snake and I'm super excited to open up my new year of blogging with a Snake theme. As you know, I'm a huge lover of animal skins and prints (just check out my latest IG post @MaryamNYC), so I'm taking full advantage with a little snake skin pattern for my first post of 2013! The Arm Candy: In honor of the Snake, I'm wearing one of my favorite bracelets -- Stella & Dot Serpent Bangle -- this exotic piece is an absolute must-have for 2013! Check out Stella & Dot's full line of exquisite jewelry and get this bracelet from my personal stylist: Aida Rodriguez. On my Nails, I'm wearing: Kiss Nail Dress Katie Cazorla Signature Series in Romance (launching Feb 2013) -- I'm a big fan of Kiss Nail Dress and this stunning glittery snake print design by Celebrity Ambassador Katie Cazorla is my favorite. Katie is the star of hit reality TV show The Nail Files and owner of LA salon The Painted Nail. Application and Wear: The strips apply easily without any major bubbling or peeling and last up to 10 days. I've cured the strips with Kiss Top Gel using Kiss PRO LED Lamp to prolong wear and match the finish of the rest of my nails. See below (*) for details. Contains: Each set comes with 28 dual-end strips for tips or toes. Availability: Kiss Limited Edition Valentine's Day Nail Dress by Katie Cazorla are available at Walgreens, Walmart and Kmart stores nationwide, retailing for about $7 per set. *On my accent nails, I'm wearing Kiss Everlasting Gel Polish Individual Color Gel in French (White), along with Kiss Base Gel, Kiss Top Gel cured with Kiss PRO LED Gel Lamp and Kiss Prep & Cleanse. I've also cured the Nail Dress strips with Kiss Top Coat to match the finish and thickness of the accent nails. The complete gel line is currently available at Walgreens, CVS, Rite Aid, Walmart & Kmart stores nationwide with the starter system costing less than a single salon gel manicure. 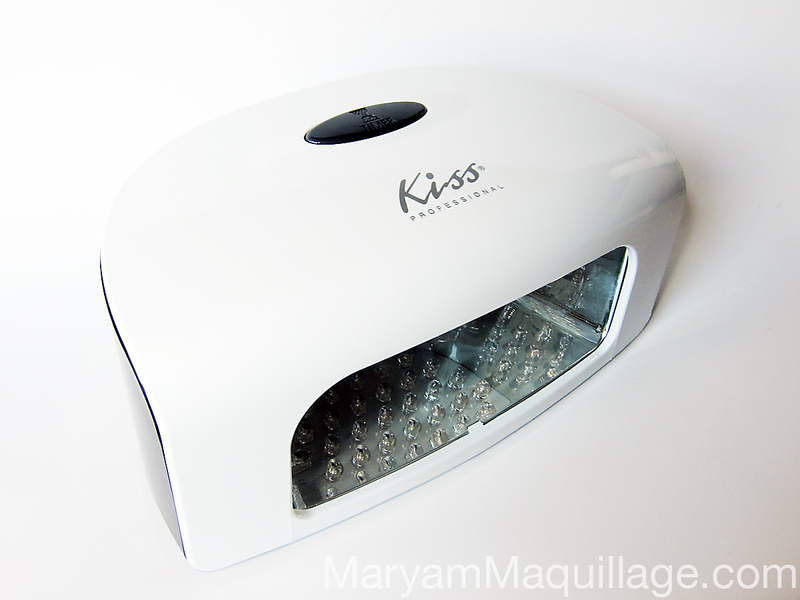 With Kiss Pro gel line, you can now get a professional salon manicure without leaving your home. The system is excellent and deserves a separate post, so expect a full review and tutorial! I had to match the nails -- I just had to!!! Apply any lipstick and blot away the excess. Reapply and blot again. Place a mesh material (or lace) over your lips and apply a contrasting eyeshadow over the material. Apply clear gloss to your top or bottom lip by patting it on. *The product/s in this post were sent for my consideration and review. The opinion stated is 100% my own. You inspire me greatly Maryam! I've never been a fan or lip tattoos or any kind of lip design, but that looks so amazing! It's really beautiful. I love your nails too. WOWWWWWWWWWWWWWWWWWWWWWWW the lips are amazing !!! OMG this is sooooo HOT!!! I am gonna try this one out for sure!! especially the lips are FABULOUSSS!!! The nails are to die for. Your lips are perfect, hun! wow! This nails are fantastic. I'm gonna try them out! Amazing, I love your looks! I recently launched my eyewear line, Enerjiee , check it out! I LOVE that snake skin look on your lips. Definitely going to be trying that! love this snake lips! wish you a great 2013! Officially LOVING your blog! As a fellow MUA, you totally have my support and admiration! I'll be checking with you often and now following on Google Friends. Look forward to watching you excel! This is really cool! It looks like mermaid scales too, with the cool colors on the lips. Love! This interesting topic is discussed with great seriousness, I learned a lot from these few lines in any case, thank you give time to your readers.